Diving or snorkeling with a foggy mask is no fun. 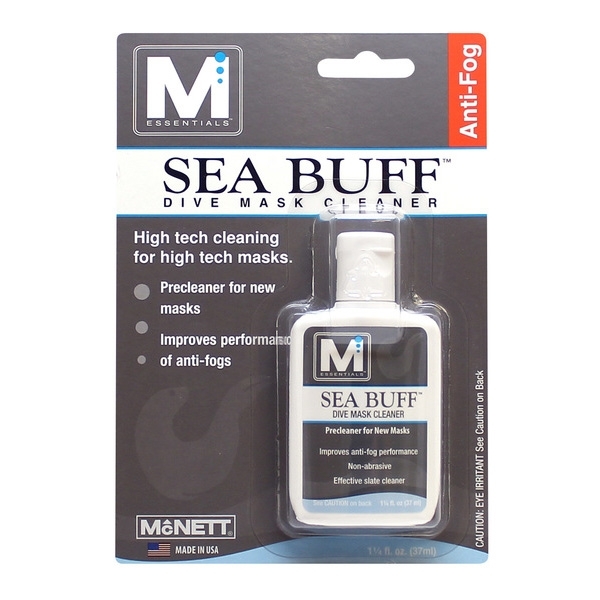 But before you can treat a dive mask or snorkeling mask with Sea Gold anti-fog treatment, you need to clean it with Sea Buff Dive Mask Precleaner by M Essentials. Our special, quick-clean formula removes the silicone residue left by the factory on new glass dive mask lenses. Plus, the lens cleaner in Sea Buff takes care of dirt, sunscreens, algae and other debris that can interfere with anti-fog treatments. Just apply, rub, rinse and repeat. Please note: For use on tempered glass lenses only, test small area before using on plastic or coated lenses. Keep your dive masks clean and ready for anti-fog treatment. Pre-cleaning with Sea Buff is step one to the clearest underwater vision and the best underwater adventures.